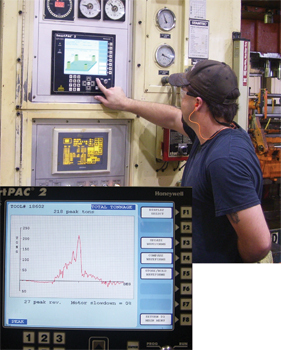 A transfer-press operator takes a look at the tonnage monitor’s plan view on the SmartPac2 to check peak tonnage at each corner of the press for each stroke. The tonnage monitor also provides tonnage history, tracking load throughout the stroke (left) and comparing it to the maximum tonnage curve of the press. ultimately will find that you have paid for it, but don’t have it. In the metalforming and fabricating arena, Ford’s perspective easily applies to press controls, where significant technology advances have continued in spite of the economic climate. State-of-the-art controls offer increased ability to handle greater numbers of sensor inputs, and boast a host of new gee-whiz features. Now it’s up to metalformers to learn how to make use of such features to collect and convey press-line data over wireless networks, and to direct and optimize the functions of all of the equipment in a press line, including servo feeds and automated end-of-line packaging systems. Those that attempt to handle complex projects with large, sophisticated and complex dies while using the control technology of yesteryear soon come to realize how astute Henry Ford’s comment was. Bottom line: Metalformers need to upgrade to newer press controls, or run the risk of “payng for it” by losing vital control over what has become a growing list of process variables. This loss of control can cause unscheduled downtime in the pressroom and wreak havoc on part quality. One metalforming company that saw the handwriting on the wall and realized that a press-automation control upgrade not only would easily provide a quick return on investment but also prepare it for future growth and prosperity, is appliance-industry supplier nth/works. The Louisville, KY stamper, which also supplies the automotive, electronics and HVAC markets, undertook an intensive program late in 2007 to upgrade the controls on all 36 of its mechanical presses. The firm operates presses from 75- to 1100-ton capacity; bed size reaches 240 in. on a couple of transfer presses and some dies contain nearly 50 sensors. For sure, state-of-the-art press controls would be needed on its presses as nth/works continued to take on these types of complex dies. But the need for additional sensor inputs represents just one cost justification for the level of investment needed to upgrade three dozen presses. An Info Center option for the controls allows press operators to download setup sheets, drawings and detailed photos of complex dies. control technology available,” says Hogan. “Escalating die complexity, with more motion occurring in the dies, more cam forms and pierces, in-die tapping, etc., required us to upgrade our sensing program to ensure that we captured all of those variables. Since beginning its control-upgrade journey late in 2007, nth/works has outfitted half of its presses with new controls (SmartPac 2 units from Wintriss Controls), and results are impressive. Plant manager Rodney Shehorn explains. “Internal PPM has dropped as well,” continues Shehorn, “a function of improved first-piece setups. We have dramatically reduced the potential for defective parts at first piece due to an out-of-control process variable. We capture more variables with the new controls and obtain dependable setups with the first try. We’re running more closely to the run rates we quote, thanks to fewer interruptions, so our quotes are more accurate. 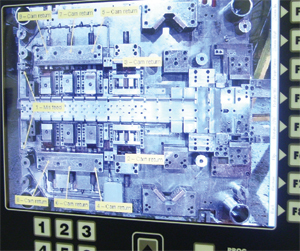 New press controls allow nth/works to continue to focus on increasingly complex parts and dies, such as the tool shown here that boasts 16 sensors. nth/works began its control-upgrade journey by focusing on its three busiest presses, 150- and 200-ton models that together account for 70-plus tools. These first-in-line presses for control upgrades run the largest variety of tools that form higher-volume parts—2 billion parts/yr. in some cases. 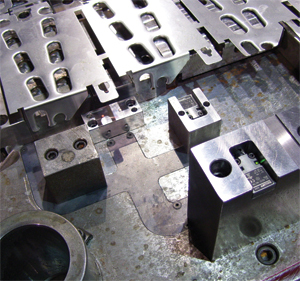 Many are multiple-part-out dies running at 100 strokes/min. or more. Most of the firm’s presses already took direction from previous Wintriss controls, which simplified the upgrade process, says Chanda. The controls use the same connections, and the existing ProCam electronic cam switches easily tied in as well. Other newly gained functionality with the controls include wireless networking so that all job settings are backed up to a network drive. The firm connected wireless adapters to the built-in Ethernet ports, and down the road, it expects to integrate data gathered at the presses into its OEE (overall equipment effectiveness) calculations. It also plans to integrate the network with its ERP system.